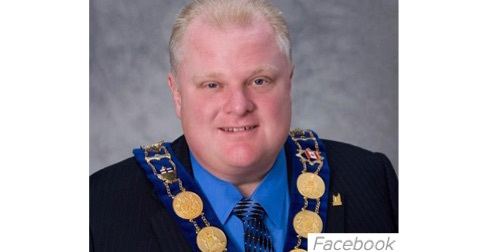 Mayors seem to have been much in the news this week, often under tragic circumstances. An Iraqi village mayor, Ahmed Shaker, was one of over 40 people killed in a suicide bombing after a football match near Iskandariya (Alexandria). Mayor Mayeur of Brussels has been speaking out since the bombings there that claimed over 30 lives. 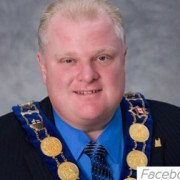 And troubled Toronto mayor Rob Ford (pictured) succumbed to a rare liposarcoma diagnosed in 2014. The 2-syllable pronunciation is especially common with younger speakers, but is not restricted to them. Mayor Nir Barkat there is said by Stephen Sackur, a major figure in BBC news, who is 52. I suspect it’s arisen partly due to the spelling (compare mayonnaise, which begins mɛ́jə), and partly due to the ever-present influence of American English, which usually pronounces mayor with 2 syllables. But it’s unacknowledged as a British pronunciation in the online dictionaries I’ve consulted, and even in the variant-rich LPD. It is in fact from prepare, said by Polish-born language teacher Michel Thomas. This kind of foreign-sounding pronunciation is actively encouraged by the transcription /eə/. Layer is probably another instance of the same change, possibly spelling-driven as well, though it must have taken place a lot earlier as a disyllabic variant is already recorded in EPD1 (1917). Prayer, on the other hand, seems to be firmly monosyllabic: I don’t think I’ve ever heard it pronounced as two syllables, either in BrE or AmE. Yes, although (as I understand it) layer and prayer have disyllabic origins, while mayor has monosyllabic origins in French maire (discounting the final schwa). Did layer become 1 syllable and then revert to 2? I think smoothed variants are more common when pre-nuclear, and when immediately before a vowel (with linking r). I’m listening out for a mɛ́jə user who smooth(e)s it to mɛː(r) in such a context. Shouldn’t be too hard to find. Very good point: 2syl vs 1syl origin – I didn’t think about that. This is a very minor objection, not at all germane to your really useful observation about “mayor”: I’m not quite sure to what extent syllabification in the source language is relevant to the realisation(s) in the borrowing language. Some Middle English spelling variants do suggest a disyllabic pronunciation: maier(e), maieur, mayor, meier(e), meihir, mehir, meigher (http://bit.ly/1RP8oA9). Words can certainly be resyllabified when they’re borrowed. Don Gi-ovanni, Dəvorak, etc. Presumably maire could have followed the same path as paire > pair. But as you suggest it must have had disyllabic variants to compete with: somehow we ended up with a 1-syll pronunciation but a ‘2-syll’ spelling, the latter now finally winning out. To repeat my question, do you think layer became 1 syll, then reverted to 2? I’m no expert on such historical questions. I suppose so, it’s from “lay” + the agent suffix ‘-er”, although at least one dictionary (the Oxford Dictionary of English) says “Middle English (denoting a mason): from lay + -er. The sense ‘stratum of material covering a surface’ (early 17th cent.) may represent a respelling of an obsolete agricultural use of “lair” denoting quality of soil”. (The OED entertains no such hypothesis.) The Middle English variants seem to be exclusively disyllabic: http://bit.ly/1RrG2d8. And is there evidence that, like mayor, it spent a good chunk of time being considered exclusively a monosyllable? 1615 Take Codlins..and lay a lear thereof in the bottom of the pye. 1616 If you lay them betweene mulberrie-leaues, or vine-leaues, one leare aboue another in a close box made for the purpose. 1658 So mixt they are one knows not whether’s thicker A Layre of Burgess, or a Layre of Vicar. * All later examples have the spelling “layer”. No, I don’t think there’s any conclusive evidence that it was ever exclusively monosyllabic: it may always have been variable. It would be interesting to see which edition of the EPD changed the first variant from one to two syllables. Fascinating. Thanks as ever, Mitko.